I ordered a new ThinkPad T400 at work for my programmer. It comes with the 1440x900 WXGA+ with LED backlight. Eventhough the Lenovo website doesn't seem to have WXGA+ LED as an available option, but I did a parts lookup and it indeed is WXGA+ LED. Oh, and the WXGA+ screen is coupled with the Intel 4500 integrated graphics and not the ATI discrete graphics. Putting it next to my T60 SXGA+ (1400x1050) completely puts it to shame. The T60 SXGA+ screen does handle documents better though since it's much taller. The T400's screen almost makes me want to go back to using ThinkPads. T60 (XP/IE8) on the left. 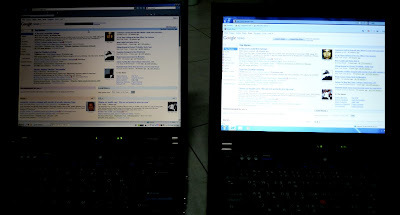 T400 (Windows 7/IE8) on the right.